Last night, we had Janet and Lindsey over for dinner. Unknowing to them, they have been added to my unofficial list of taste testers, my lab rats. On the menu were three of my tried and true recipes: guacamole, roasted chicken and avocado coleslaw; only this time I used all of the avocados in the guacamole so it was just coleslaw. The new recipe (this is where the lab rat part comes in) was a roasted asparagus pilaf. I have made this before with brown rice but this time I was inspired to use cracked wheat. I experiment with new ingredients often and have recently been trying to steer away from white rice and white flour. Cracked wheat is just one of many grains which can be substituted for white rice. Cracked wheat looks similar to bulgur. In fact, they are both made from whole wheat kernels that had either been crushed or broken in to very small pieces. 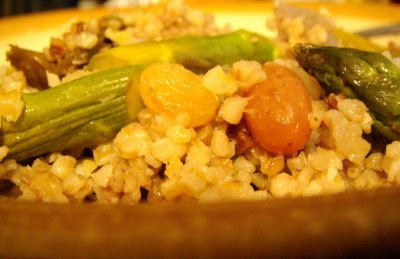 The difference is bulgur wheat kernels are steamed and toasted before being cracked; cracked wheat is not. Both are a good source of fiber and are both low glycemic (GI) index foods. Cracked wheat is quite popular in many Middle Eastern and North African countries and sometimes functions in the same way that rice does: as a base for savory meats and vegetables stews. Since it functions like rice, it works well in this pilaf. It also imparts an earthy, wheaty flavor. Remember, it is always a good idea to wash this type of wheat before cooking. This recipe is so quick simple, it's perfect as for a week night dinner. Also, mix it up a little; try different types of nuts and dried fruit or a combiation of both. 1. Spread asparagus evenly on a baking sheet and coat well with olive oil. Season lightly with salt and pepper. Roast in a 450 degree F oven for 5 minutes. Remove from baking sheet. Once cool to the touch, cut diagonally and set aside. 2. Meanwhile, place a heavy pot over medium heat. Pour wheat and vegetable stock and cook until all of the stock has been absorbed and the wheat is soft and fluffy, about 15 to 20 minutes. 3. Add diced red onion, raisins, shredded coconut, chopped pecans and asparagus to wheat. Toss well. Serve warm. Note: This recipe has been entered in Mansi's Healthy Cooking blog event at Fun and Food.